In August of 2014, SSP sent letters of greeting to Pope Francis and Father Benedict (Pope Emeritus Benedict XVI). 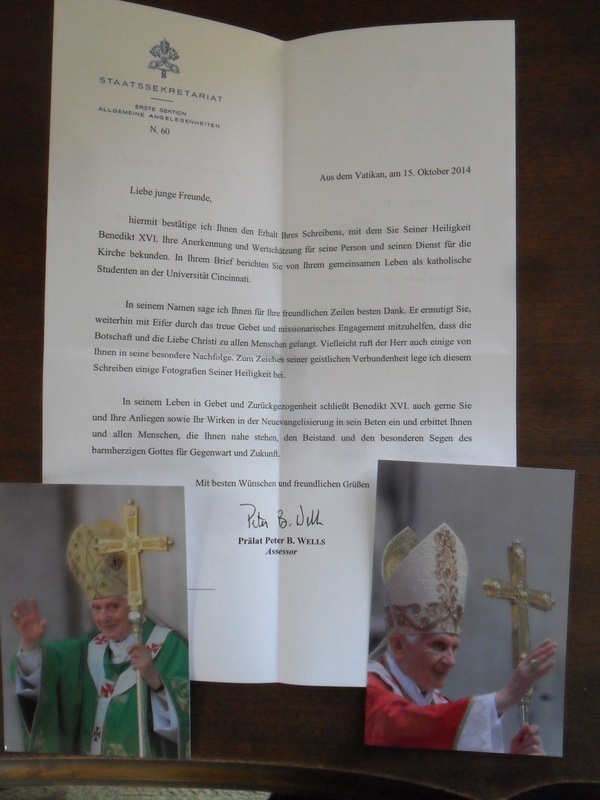 In October 2014, the representative of Father Benedict responded on his behalf, and in German since the first letter was written in German. I hereby confirm the reception of your letter in which you manifest your recognition and appreciation to His Holiness Benedict XVI. for his person and his service for the Church. In your letter you tell about your common life together as Catholic students at the University of Cincinnati. I thank you all in his name for your friendly words. He encourages you to continue to help with fervor through true prayer and missionary engagement, that the message and love of Christ reaches all people. Perhaps the Lord is also calling some of you into his (Benedict’s) special succession. As a sign of his spiritual communion I am putting some pictures of His Holiness with this letter. In his life in prayer and seclusion, Benedict XVI is also gladly including you and your requests as well as your work in the New Evangelization in his prayer and asks you and all people who stand close to you for support and the special blessing of the merciful God for the present and future.